When I first started doing yoga postures, I heard that Yoga would make you taller. Being about 5 foot 2 inches in height, I always liked the idea of growing taller. And although after many years as an Ananda Yoga practitioner and teacher, I still don’t tower above the general population, I can say that at 62 years old, I have not lost any height. In fact I measured 1/2 inch taller at a recent medical appointment. Emphasizing spinal length and space is a key feature in the practice of Ananda Yoga. On a physical level, attending to posture and maintaining healthy natural curves of the spine through yogic awareness and asanas counteracts the pull of gravity and the decline in muscle strength that commonly compress the vertebrae and internal organs as we age. Paramhansa Yogananda said “Those people who sit with a bent spine, and walk with a caved in chest, squeeze the diaphragm and lungs and prevent them from properly opening and receiving the amount of oxygen necessary”. That bent spine position also puts us at risk for compression fractures of the vertebrae. On a mental emotional level, strong tall posture improves mood making us feel more uplifted and empowered which translates into more success in all areas of our lives. With less stress from improved outlook on life, cortisol levels are balanced which enhances preservation of healthy bones. Asanas that challenge our ability to stand on one leg such as tree or eagle pose provide additional yogic benefits for bone health by improving the sense of balance which can help prevent one of the most common causes of bone fracture: falls. Yogananda’s unique contribution to the science of yoga, the Energization Exercises “strengthens tissues; awakens lazy muscles; forms osseous or bone tissues and accelerates involuntary functions, such as those of the heart, lungs, stomach and intestines, capillaries, lymphatic glands, veins and brain. Ordinarily we have no direct control over …involuntary processes of the body. But we can influence them by the exercise of voluntary muscles over which we do have control.” Energization “teaches how to surround each oy cell with a ring of supercharged electrical vital energy and thus keep the body cells free from decay or bacterial invasion.” From How to Achieve Glowing Health and Vitality by Paramhansa Yogananda. So keep up a dynamic practice of Ananda Yoga and Energization Exercises as these can be a powerful and effective therapeutic combination when specifically targeted for bone health to make sure we go forward through our lives walking, standing and sitting tall, uplifted in body and mind. 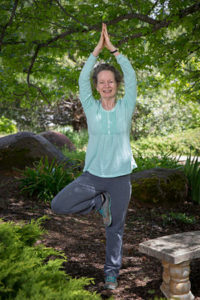 This entry was posted in Yoga and tagged Ananda Yoga, Yoga for bone density, Yoga Students with Unique Needs, Yoga Therapy, Yogananda's teachings. Bookmark the permalink. Thank you, Maitri, for this informative and inspiring article! It’s exactly what I needed at this time. I am glad that it is helpful! Thank you, Maitri, for this beautiful article! Meditation is essential to feel well and live a Happy Life. It eliminate negative thoughts, worries, anxiety, all factors that can prevent us feeling happy. It has been proved that the practice of meditation, carried out on a regular basis, will reduce stress and anxiety(https://urbanbuddha.in/). Nice article, Maitri. Thank you! Do you adapt the Energization Exercises by holding the tension for a certain length of time? Thank you for the question, Andra. I do the Energization Exercises as usual in the morning. Then during the day I sprinkle some of the exercises in a modified way holding the tension for at least 12 seconds which gives more time to initiate the bone building process. I especially like doing back recharging, tensing left lower back, then right lower back, left middle back, right middle back, left upper back and right upper back, holding tension without relaxing, until the entire back has dynamic tension for 12 seconds. This helps to keep my back and spine awake and ready! Thanks Maitri for explaining standing poses, certainly create space and we develop core strength to feel for aligned.We feel emotionally fore relaxed when our body is more comfortable Mind and body coordination add peace and we become more spiritual,lessed negativity and more meditation.